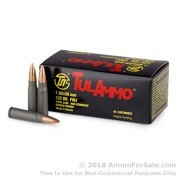 7.62x39mm Ammo For Sale - Feed Your Guns! 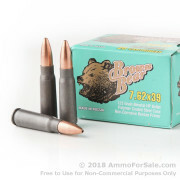 This video of the 7.62x39 ammunition we have for sale provides a humorous overview and history of this venerable caliber. 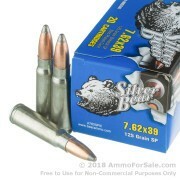 7.62x39 is the best rifle bullet in all of the world. This bullet is invention of 1940 Soviet Russia. Comrade Kalashnikov make it world famous with the AK-47 assault rifle. 7.62x39 rifle, it is medium sized. It's not too big or too small. It has easy recoil, so even smallest comrade can use. It also has very big bullet. Enemy hiding behind brick wall or metal jeep is no problem. Bullet will make big hole. Mother Russia still make many of the 7.62 bullet. It use steel case because, hey, is only bullet. Shiny case of brass is for show-off American fancy cowboy. Pretty boy American have many fun times with copy of AK-47 rifle using 7.62 bullet. They like it for the reliability and price. Is so cheap, one box is cost even less than even a peasant child's shoe. If capitalist dog politician take away AK-47 type rifle, is OK. You can use 7.62x39 caliber with American Ruger Mini 30 Ranch Rifle or something else like that. 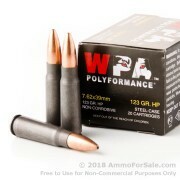 Anything is better than wimpy .223 bullet with silly plastic black rifle. What if you must use the rifle at night? It is so black, you cannot find it in the dark. And that is just one reason why 7.62x39 is the best rifle bullet in all of the world. 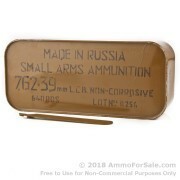 Bulk 7.62x39 ammo - maybe the best gift we continue to receive from Russia today! 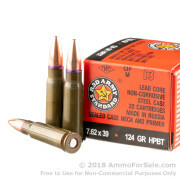 Some may see 7.62x39 ammunition as a nod to communism and maybe even the past but the cartridge remains extremely popular among American riflemen today. 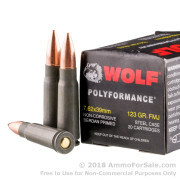 With several Russian manufacturers like Wolf and Tula produsing full metal jacket rounds and American companies like Hornady producing more sophisticated loads for hunting, if you're an AK-47 shooter or own some other rifle chambered in 7.62x39, you're bound to find what you need for sale below. 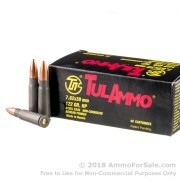 The only budget Ammo in 7.62X39 that shoots accurate enough in my AK rifle to leave all the rest of the pack in the dust, especially Tulamo with (what I consider to be) problematic " lacquered gray steel cases "
Master Blaster on 1000 Rounds of 124gr FMJ 7.62x39mm Ammo by Wolf Mil Classic WPA Ammo. About average in accuracy. Tends to deliver about 2.2 MOA out of a CZ 527 that will shoot under 1 MOA with Yugo M67 or most premium ammo. Better than Wolf or Tula standard by a bit. 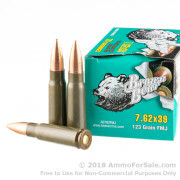 Bonzaipilot on 500 Rounds of Polymer Coated 123gr FMJ 7.62x39mm Ammo by Brown Bear Ammo. 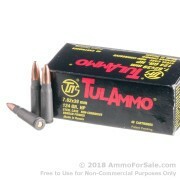 I have used a lot of this ammo. Its a great value for a great price. Never had any issues shooting it through my SKS. 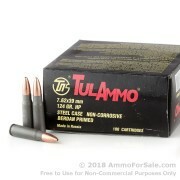 AMMO is very reliable and accurate. 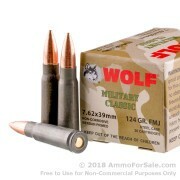 If you love to throw a lot of rounds down range, or stick up for a possible apocalypse, then these rounds will do you right. VIVA SECOND AMENDMENT!!! VIVA MY FELLOW SHOOTISTS!! 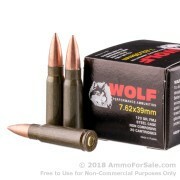 Jimmy White on 1000 Rounds of 123gr FMJ 7.62x39mm Ammo by Wolf Ammo. 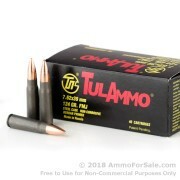 7.62x39 Ammunition: What's So Awesome About It? 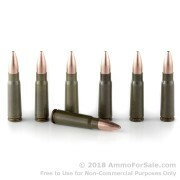 The original 7.62×39 ammo cartridge was introduced in World War 2 and was first used in the SKS carbine gun by the Soviet Union. 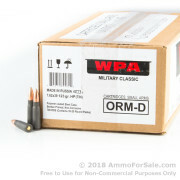 This cartridge is commonly used by both civilians and militaries, as the popularity of the AK-47 and SKS pattern rifles saw a great rise during the twentieth century. The 7.62×39 cartridge was probably influenced by several foreign developments, particularly the pre-war, 7.75×39mm German GeCo experimental round, and maybe even the late-war German 7.92×33mm Kurz. 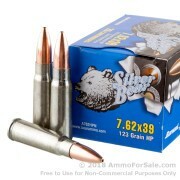 7.62×39 ammo for sale in the United States has been used for hunting game since the 1990s. 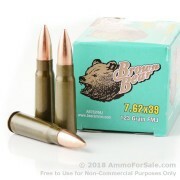 It is suitable for hunting since it is about as strong as the .30-30 Winchester round. 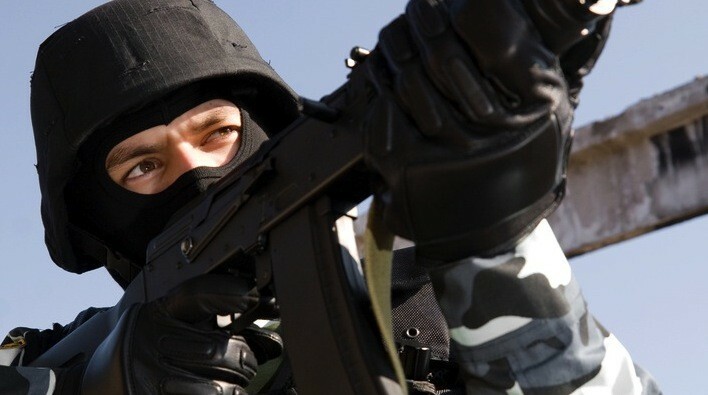 7.62×39 ammunition is also known as the 7.62 mm Warsaw Pact, 7.62 mm Soviet, or the 7.62 mm ComBloc. In the United States, it was also known as .30 Short ComBloc/Russian. The “Short” part of the term was used to differentiate it from the previous .30 Russian versions (the 7.62×54mmR). The world’s most renowned military rifle (the AK-47) was specifically created for this cartridge after the war. The 7.62×39 cartridge was the Soviet standard until the 1970s, and it is to this day one of the most popular rifle cartridges used globally. 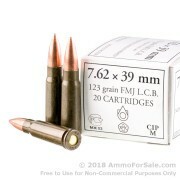 Most 7.62×38 ammo for sale today has a 2.31 ml cartridge case capacity. 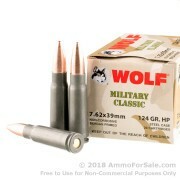 Many Russian 7.62×39 ammo cartridges (such as the ones sold by Wolf, Tula, and Golden Tiger) use a modified M67 bullet with a nose that has airspace cast into it, with ballistic-enhancing tip design that greatly improves tumbling tendencies and fragmentation for a stronger stopping power. Many affordable imported semi-automatic rifles, like the AK-47 and SKS variants and clones, can be found in this caliber, and Ruger produces the Mini-30 rifle as a 7.62×39 variation of their renowned Mini-14 rifle. 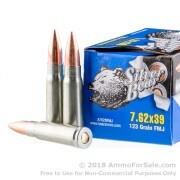 The high availability and low cost of military surplus ammo makes most of the 7.62×39 ammunition for sale an attractive buy for many civilian shooters. The cartridge is used by hunters, target shooters, ranchers, militaries, and it is also used for estate security in some parts of the United States.